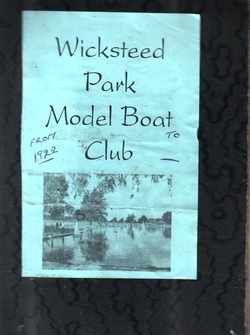 The following is a brief history of Boat Clubs at Wicksteed Park up to the 75th Anniversary in 1996 and was authored by Dennis Warren, a long standing member and former officer of the Club especially for that occasion. He is also the owner of the collection of historic material relating to Boat Clubs at Wicksteed Park from which the accompanying pictures are drawn from. Further history can be found here. This page covers the redevelopment and ongoing maintenance of the lake from 2003 to the present day. The redevelopment was paid for largely with a government grant and the remaining funds from the 'park bosses'.